Most people know churrasco as a grilled thick cut of beef, very popular in Brazil, where they have specialty restaurants called churasqueiras, as well as in Argentina and Uruguay where churrascos are part of the popular asados or parrilladas. Ecuadorian churrasco is sort of the poorer cousin of the Brazilian, Argentinean and Uruguayan churrasco. It is made with a thin cut of steak, and it actually refers to an entire plate of food: a grilled, or sometimes fried with onions and peppers, steak topped with a fried egg served with rice, French fries, ripe plantains, a small salad, avocado slices and hot sauce. 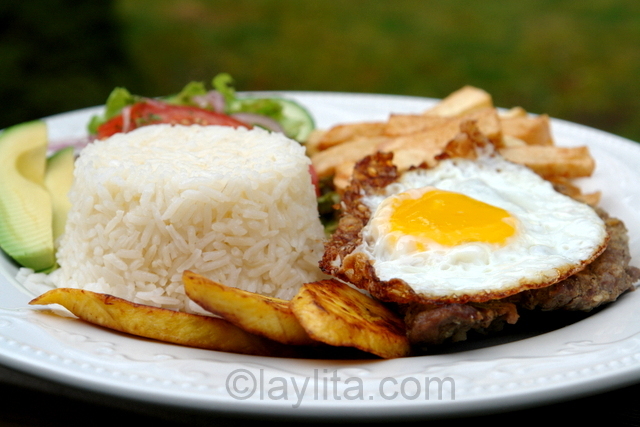 Ecuadorian churrasco is a traditional dish made with steaks, grilled , or sometimes fried in an onion and pepper sauce, topped with a fried egg and served with rice, fries, plantains and salad. 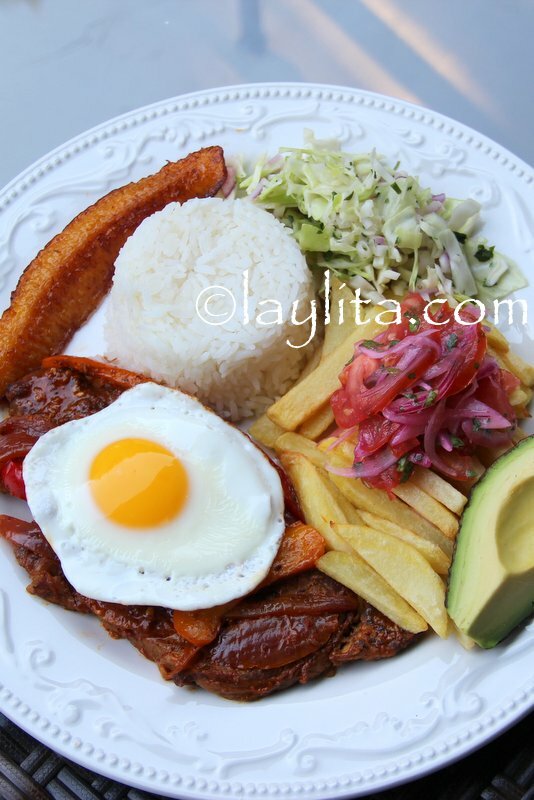 Ecuadorian style rice, fried egg, homemade fries, fried ripe plantains, tomato and onion curtido salad with cucumbers and lettuce, avocado slices, and aji criollo or hot sauce. Mix the crushed garlic, cumin, salt and pepper together to make a marinade for the meat. Rub the garlic cumin marinade on the thin steaks and let marinate for a couple of hours. Grill or fry the steaks over high heat to desired doneness; since they are relatively thin they won’t take too long to cook. 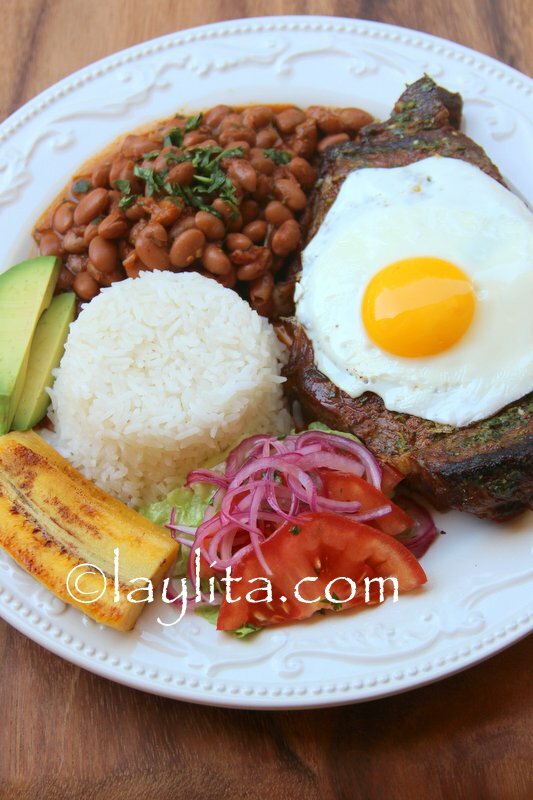 Serve the steaks with a crispy fried egg or two on top and accompanied by rice, homemade fries, fried ripe plantains, tomato and onion curtido, lettuce, cucumber slices, avocado slices and aji criollo. 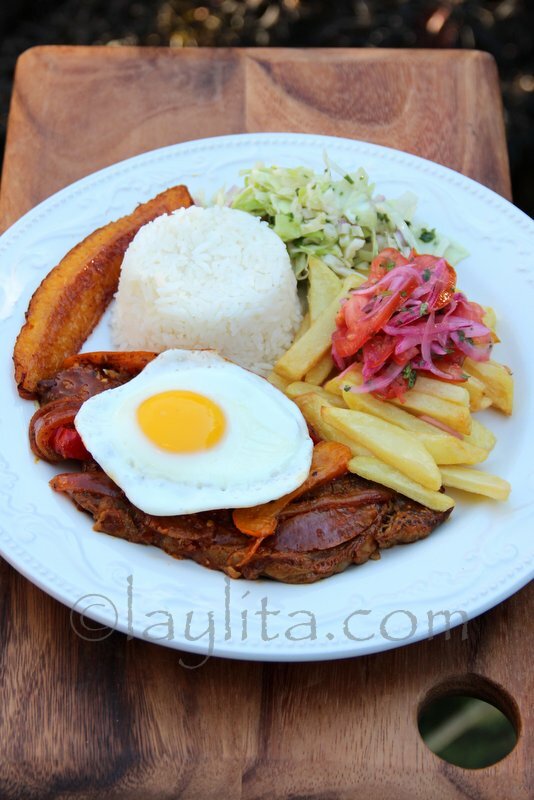 Most restaurants that serve national or traditional Ecuadorian food will have a version of churrasco on their menu. 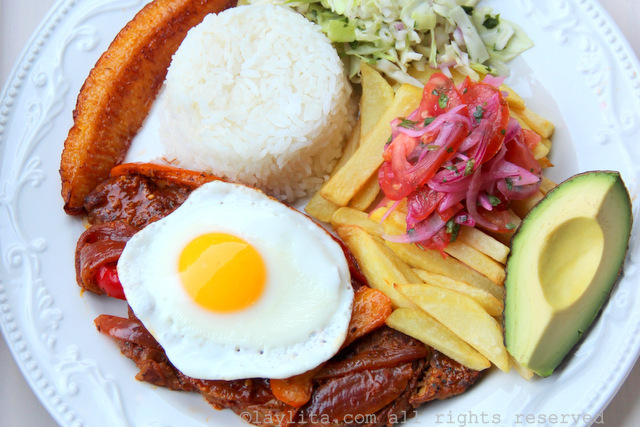 It is a pretty big plate of food, which is typical of an Ecuadorian almuerzo or lunch – consisting of a soup as a first course, large plate of rice with meat, small salad, sides like yuca or cassava, potatoes, and plantains as a second course, and a small dessert or fruit as a final course. An almuerzo is a lot of food, you can ask for just the soup or just the second course if you feel it is too much. Even just the churrasco plate is a good amount of food with double carbs and double protein, I try to make on those days when we really deserve it (i.e. after hiking the whole day). I like the way it allows you to combine flavors, a bite of egg and meat with some avocado or a bite of meat and potato with some pickled onion. It’s also a good plate for kids because it gives them a lot of different options, even a picky kid will find something to eat on a churrasco plate. This is a goldmine! Yummy!! Gracias! Vivia en Quito por un ratito y queria preparar un plato tipico para mi papi en los EEUU. Gracias! Whoa, it’s a lot of food! When we were in Quito a little while ago, we had this along with Locro (potato, cheese and avocado soup), some pasty-like appetisers, and ice cream afterwards. We could barely walk! I agree – this is brilliant post-hiking food – I think the best one I ate was at La Terraza in Vilcabamba, but I pretty much ordered one whenever I could. Seemed like the egg was less common further south, especially once you hit Peru – most places we went were happy to add it if you ask. Let’s face it – the fried egg is vital! 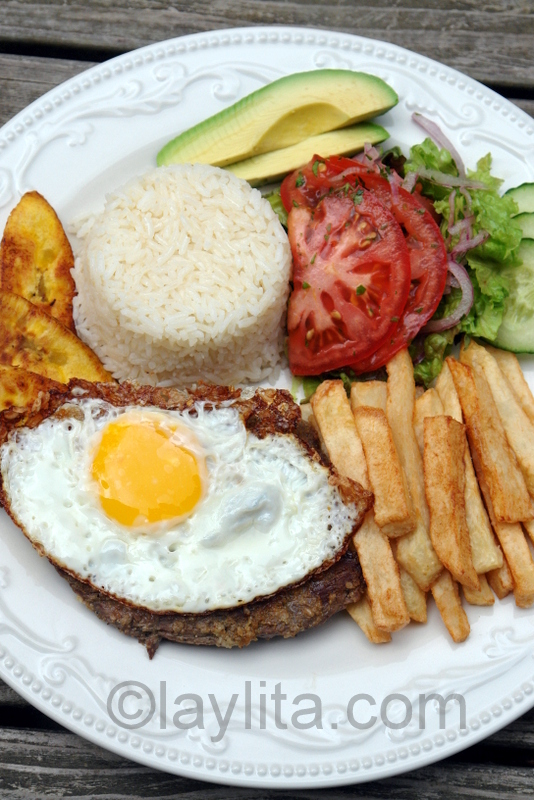 Completely agree on that, it wouldn’t be a proper churrasco without the fried egg! I really enjoy your wedsite . I enjoy cooking your food. What a fabulous meal, I love the combination of foods included. I love visiting your blog. Hey! esta bueno el website y las fotos de los platos estan exelentes, vivo en Shanghai en china y ya extraño la rica comida de Ecuador! soy quiteño, sin embargo te recomiendo mejorar la categorizacion de los platos pues los encuentro un poco en desorden, espero poder dar uso de todas estas magnificas recetas, good luck with the site!!! When I was in Quito earlier this year, I had a fabulous steak… and that looks just as good. I never had it with an egg, but I’m sure it will work well. Rico! Naci in Quito Ecuador y este is my plato favorito junto con los yapingachos. Porque no tienes aqui una receta sobro como hacer los yapingachos (tortillas de papa con hornado y el curtido picante y dulce ? Mil gracias por difundir my cultura ecuatorian en todod el mundo….Wil. Lo que comi cada vez que iba al restaurante en Ecuador, que chiste de verlo aca… :)… Buenas memorias. Mmmm…lomo a lo pobre…que rico! What a fabulous meal, I love the combination of foods included. I love visiting your blog, it’s such a great read. 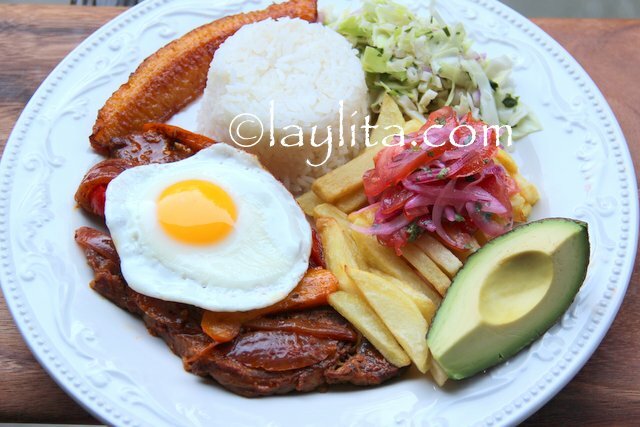 This is so similar to the Columbian meal Bandeja paisa – and definitely not much of a ‘richer cousin’ since the meal is similar, except for the addition of chicharron and beans. VERY hearty and VERY delicious. Top anything with a fried egg and I’m there! What a great meal! I love steak and eggs! I made a very similar dish last month based on one from our favorite Peruvian restaurant. Well done! I love plantain! I never thought to have it with eggs though – thanks for the tip! Wow, this looks fantastic – and I know my husband would *love* it. I really enjoy your blog!